Monday night’s crowd at Yoshi’s Oakland was lively and responsive and actually a bit over-the-top, but when some big-name guys make the trek here from New York — hey, why not? I was happy to see them, too, and glad they drew a bustling, receptive crowd. And it was good to hear Michael Formanek‘s band outside the spacious ECM shell of their record, The Rub and Spare Change. (Reviewed here.) I actually love that ECM sound, which I don’t find as antiseptic as some critics say, and which does leave room for a brilliantly burning energy. But live music, for many performers, benefits from being more visceral. That’s what we got: a more visceral, gut-reaction version of the quartet, with songs nourished by repeated live performances. A review of the band’s recent L.A. gig noted that “Tonal Suite” was the opener — the five-segment, 17-minute “Tonal Suite.” I wasn’t sure how the audience would take to that, but they went ape over it. 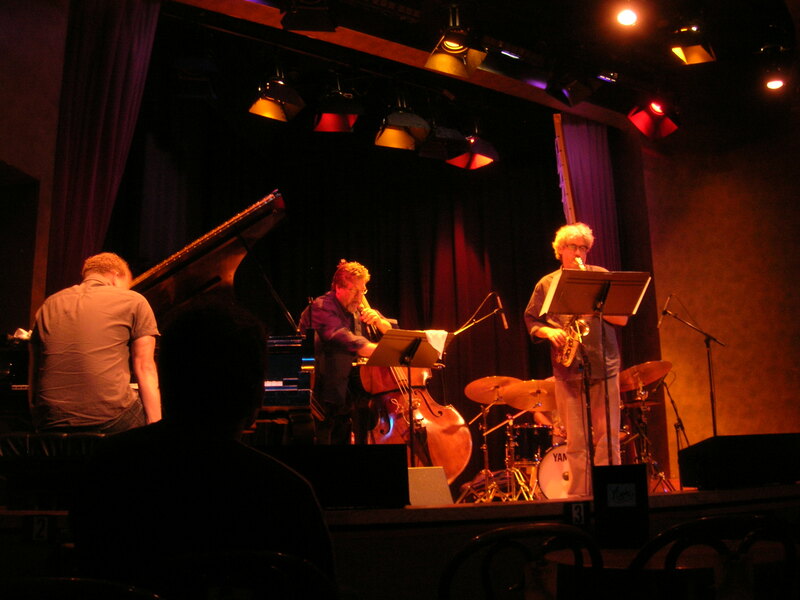 People didn’t applaud after solos — it’s hard with creative music, since a “solo” overlaps so heavily with the rest of the piece — but they seemed to be well into the groove with Tim Berne‘s spirited sax solo, and they appreciated Craig Taborn‘s bright piano splashes. It helped that “Tonal Suite” ends with an active, upbeat theme that gets repeated here and there, complete with a nifty false ending, like an inside joke. The encore was “Twenty-Three Neo,” the opening track to The Rub and Spare Change, which is based on a delicate and hypnotic piano line. They played it even more slowly, more delicately, than on the CD — a different kind of “visceral” breakthrough. Cleaver was a model of restraint, using silence as the glue to hold the piece, rather than breaking the careful mood. Formanek has some roots in the Bay Area and mentioned the December passing of “Bishop” Norman Williams, crediting him as a major influence that steered him towards the edgier side of jazz. Good work, Bishop. Hopefully, you’d agree that you did good work here.